Are your vines producing too much fruit, yes there is such a thing. On ideal bloom conditions or on some varieties of muscadines the vines can over crop or over produce themselves. In my opinion I believe the ideal fruit load is around 60 pounds per vine, if your vine has more fruit than this you could be headed for trouble. 2. 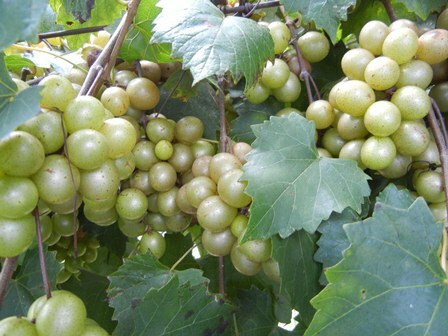 If the vines do not drop fruit, sometimes during the harvest the plant will drop its leaves. The vine will lose its leaves and then any fruit that has not ripened will hang on the vine and never ripen. The leaves are working so hard to ripen the fruit they exhaust themselves and shed off. 4. The vines are so stressed and weak headed into the winter months they become vulnerable to cold weather injury, which can lead to main arm dieback or vine loss to cold injury. 1. In the past we would try to control over production by thinning the fruiting spurs further apart during our winter pruning. This technique works well, the only down side is if we have less than ideal conditions during bloom and we do not have a good fruit set we have decreased our crop that much more by the removal of additional fruiting wood. 2. Preferable shortly after fruit set, any vines that appear to have over cropped we will hand remove up to 20 cluster per vine. The earlier in the summer the fruit is removed the better, thus allowing the vine to only focus on the fruit remaining on the vine. We will start on one end of the main arm and worked our way down the vine randomly pulling green clusters off, if a side lateral has multiple clusters of fruit we will always remove the cluster the furthest away from the main arm. The following muscadine varieties are the most likely to over crop. However, any given year any variety can over crop and you should always pay attention to self fertile varieties since they max their crop out every year. I would rather have a vine that produces 60 pounds of fruit for 25 years, versus a vines that produces 100 pounds of fruit one season and then struggles the next year.